This is a Travel Itinerary for Rome in Italy, helping you to get exact directions on what to do in the eternal city. – In which hotel to stay? What is the best value for money hotel in Rome, that will help you be in the epicenter of all activities? – What to do in Rome and what to see every day of your 3-day trip. Best things to do and See in Rome. – Where to eat. What to try from the local cuisine. Best restaurants that only locals know. – Where to go out in the evening. Best bars and clubs for your evening entertainment. It’s just like having your best friend in Rome , showing you around to the best that the town can give you. Get this travel itinerary now, save time and money from organizing your trip but most importantly, enjoy this experience to its fullest! 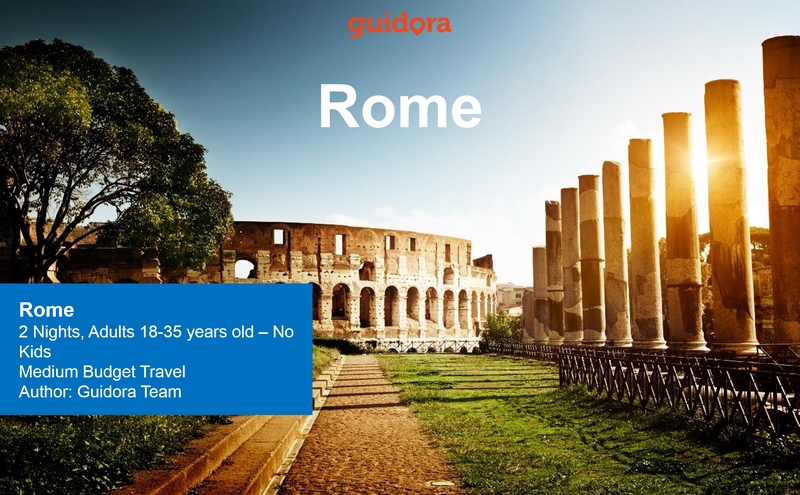 This perfect Travel Itinerary and Guide is downloadable in PDF format so that you can enjoy it in your smartphone, iPad, tablet or your laptop (or even print it) and take it with you, while you are at Rome. It also includes all the transportation directions from the suggested hotel to different places, in Google Maps format, so that you don’t spend time searching for everything.